There's only one thing my kids like more than baking. And that's decorating with sprinkles. Not just any sprinkles; in addition to "regular" sprinkles we have some shaped like tiny cows and others shaped like tiny pigs. 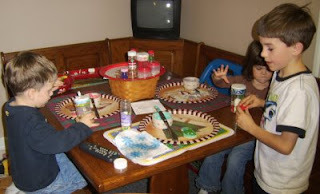 Here they are applying a generous coat of icing to cookies shaped like rocking horses, snowmen or stars, and then dumping on a crunch-adding amount of sprinkles. These are the perfect cookies to leave for Santa. I guess we'll have to make more since these are already gone! All three of my kids are really looking forward to Christmas. Morgan's favorite song right now is Santa Claus is Coming to Town. I think she's a little worried that Santa will find out that she broke her Precious Moments figurine, smeared poop on the bed, used up her mother's face cream, and colored on the wall--and those are just yesterday's sins. 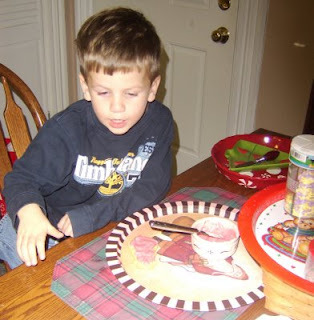 Justin made some reindeer food at preschool (oats and glitter) that is to be sprinkled on the lawn Christmas Eve. I bet he's the only kid in his class who will remember to go outside Christmas morning and see if the reindeer enjoyed their snack. 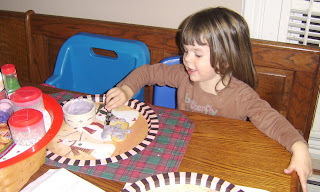 Only farm kids would consider food and water for the reindeer as much of a priority as Santa's cookies. 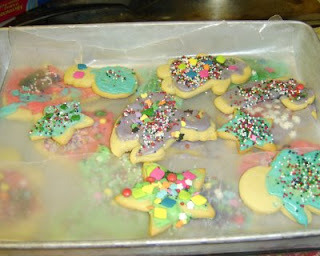 Fortunately, we'll have cookies with the most sprinkles per square inch of any offered Christmas Eve. And we'll have reindeer food, a bucket of water and even carrots for Santa's herd. I just hope pigs like oats with glitter, you know, in case the reindeer don't eat them all.